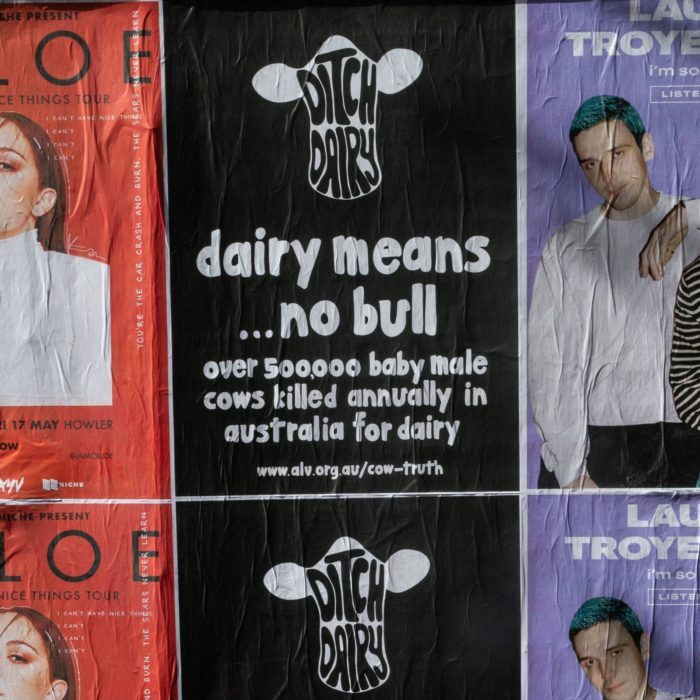 A new 'ditch dairy' poster campaign has spread across Melbourne, which satirically mimics an advertisement originally by a dairy company. 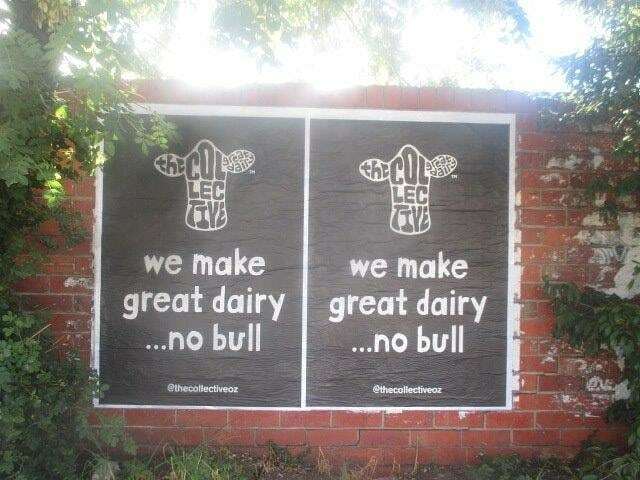 A poster campaign by The Collective, an Australian dairy brand, was spotted by a vegan activist recently. The copy read ‘we make great dairy… no bull’. This play on ‘no bullsh**’ and male cattle, is in bad taste from an industry that exploits these kind creatures. Through years of cultural conditioning and clever advertising by the dairy industry, society as a whole seems to have forgotten that a cow can only lactate if she has been pregnant. 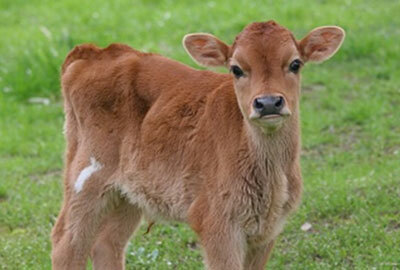 Just like every other mammal, the purpose of a cow’s milk is for her newborn baby to drink. So what happens when humans want to drink her milk instead? What happens when we want a cow’s milk for making cheese or ice cream? The mother cow’s baby will be separated from her. If the baby is a girl, she will be raised to become a cow exploited for dairy too. If the baby is a boy, called a bobby calf, who will never produce milk himself, he is seen as a ‘waste product’ of the industry, and serving no financial purpose, is killed. When The Collective say no bull, they really mean it. There are no bulls in dairy, at least not alive for long anyway. Currently there is a ‘ditch dairy’ campaign which through satirical mimicking of The Collective’s advertisement for cruel products, sets the record straight. This quote comes from numbers shared by the Australian Bureau of Statistics. This statistic is even potentially an understatement, with other reputable sources quoting deaths up to 700,000 per year. In a time where we are seeing a scared dairy industry attempt to sue vegan businesses for ‘falsely advertising’ their plant based products as ‘milk’ (cashew milk, soy milk, etc.) because they come from plants and not exploited cows, this is a welcome dose of truth in advertising. Learn more about dairy cruelty, and sign up to Vegan Easy to be sent emails full of information and delicious recipes free of cow and other animal exploitation now! 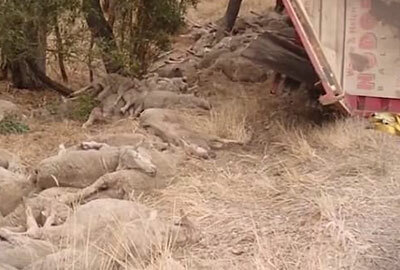 A horrific truck smash has ended in the agonising deaths of more than a hundred sheep, with several more running from the scene. 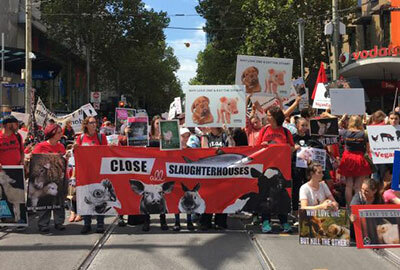 About 600 protesters demanding the closure of Australian slaughterhouses have shut down a major intersection in the CBD. 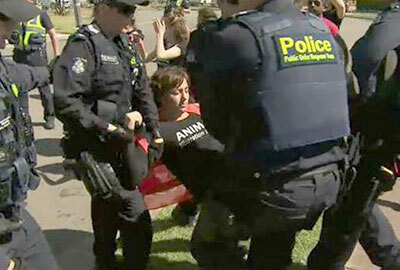 Dozens of animal liberation protesters have gathered at three Melbourne abattoirs in an attempt to block trucks carrying livestock in for 16 hours. Want a free copy of the greatest love story every told? 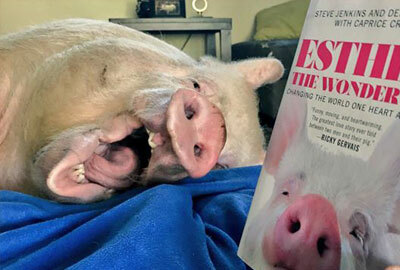 The first 30 people to become Animal Liberation Victoria monthly supporters will get a copy of the new Esther the Wonder Pig book. You will also be helping us save lives. 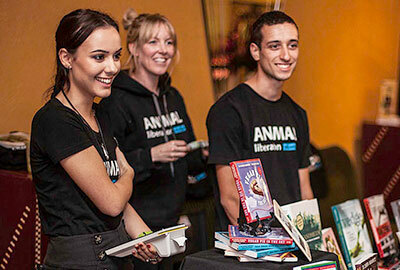 An exciting opportunity has arisen to join our team at Animal Liberation Victoria, as a casual Outreach and Volunteer Coordinator. Is bringing dead calves to a dairy farmers’ rally a stunt in bad taste, or a clever way of highlighting some harsh realities of the industry?